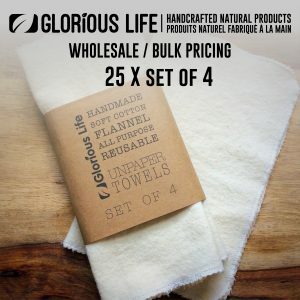 View cart “Bulk Order – Wool Dryer Balls – 25 x Set of 3 – Natural Wool Laundry Dryer Balls- Wholesale Pricing” has been added to your cart. 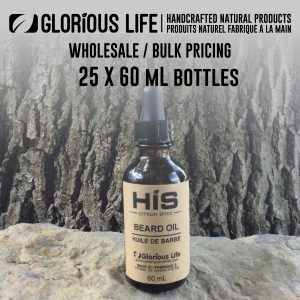 Looking for a unique, natural, and useful gift to give your guests? 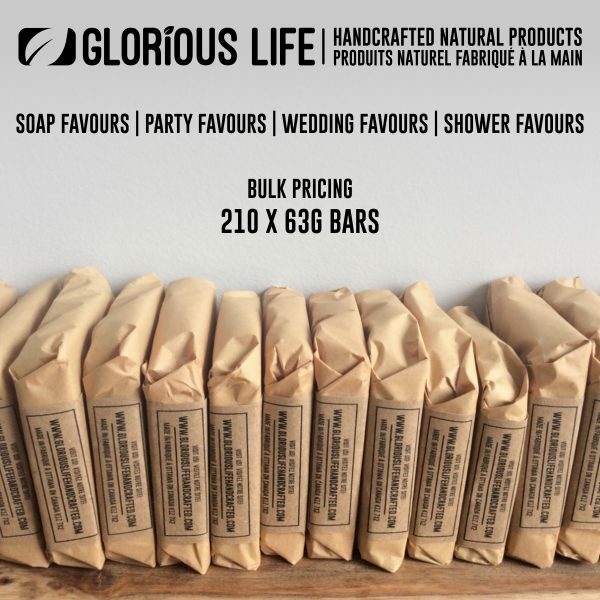 Glorious Life soap would love to help you with that with our made to order soap favours. 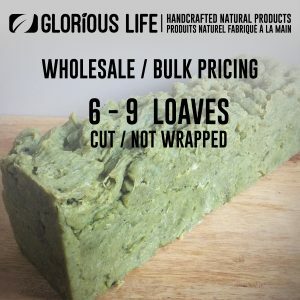 My soap is handcrafted, all natural, pure vegan, and crafted without gluten ingredients. To create the most natural bar, I don’t add preservatives, detergents, dyes, artificial colours or synthetic scents. What you will find in my ingredient lists are vegan oils (olive, coconut, sunflower, shea butter, castor – vary by bar); herbs, spices, clays to colour, and pure essential oils in my scented bars. Each bar weighs approximately 63g and measures approximately 2.75″ high x 2.75″ wide x .6″ thick. They are individually wrapped in Kraft coloured tissue paper and and Kraft coloured Glorious Life soap band indicating the soap selection and the ingredients contained in the bar. 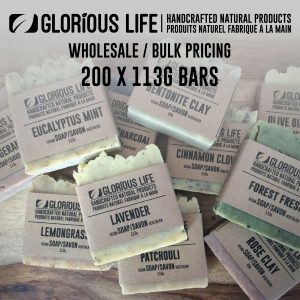 You may mix and match soap selections in multiples of 15 – so up to 14 different selections when purchasing this listing for 210 bars. LAVENDER – The fresh floral scent of lavender, with the very gentle exfoliation of chamomile flower. FOREST FRESH – Scented with the essential oil of conifers. A woodsy bar that’s not too masculine and very fresh. PATCHOULI – Musky, earthy, spicy. CINNAMON CLOVE – The warm scent of cinnamon and clove. ACTIVATED CHARCOAL – Coloured with activated charcoal which has long been used in facial bars. OLIVE OIL CASTILE – A mild scent free bar gentle enough for any skin type – even baby’s. CALENDULA & CITRONELLA – Enjoy a strong lemony scent? This might just be the bar for you, with the added benefit of calendula. LEMONGRASS – A fresh, herbaceous lemony aroma. BENTONITE CLAY – A mild, unscented facial cleansing bar. ROSE CLAY – This bar is unscented but beautiful. It’s wonderful rose colour is derived from red clay and makes a wonderful facial or body bar. ROSE GERANIUM – The sweet floral scent of rose geranium essential oil. Simply gorgeous. SPICED PUMPKIN – Pumpkin, cinnamon, nutmeg, allspice, & clove. COFFEE SCRUB – An extra moisturizing bar with coffee grounds for a gentle cleansing scrub – great for gardeners! My current turnaround time no craft, cure, wrap, and package your order for shipping is approximately 4 – 6 weeks. All orders are shipped via Canada Post parcel services.